The Exhibition “Order and KAOS” is viewable during normal theatre opening hours which are usually Tuesday – Saturday between 10am and 10pm. I really depends what is going on at the theatre. 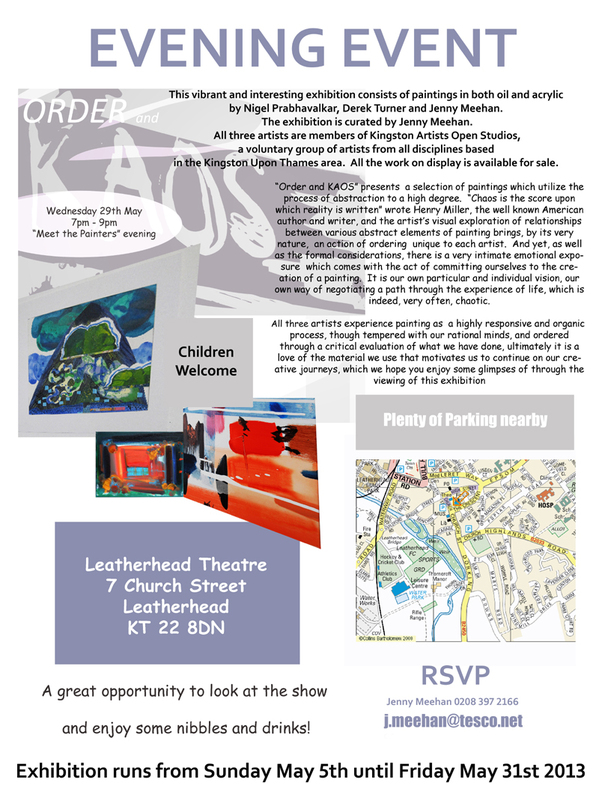 During the Drama Festival at Leatherhead Theatre the exhibition can be seen on Mondays too. The best thing to do is to phone Leatherhead Theatre Box Office and check before coming if you have a distance to travel. The Leatherhead Theatre Box Office number is 01372 365141. Having spent a lot of time and money on printing artwork over the years, I am really impressed with Poster Pigeon http://www.posterpigeon.co.uk/ …and not only because of the name, which is a stroke of inspiration in itself of course! The prices are really excellent and the quality is stunning too. I cannot wait to get my recent “Signs of the Times” series of prints back, and I will be exhibiting some of those at the Cornerhouse Community Arts Centre in Tolworth, Surbiton, in June (KT6 7SB). When I find something worth shouting about, I do tend to shout about it, if it is good. If you like geometric abstraction, colour, expression of feelings and if Kandinsky-ish type of visual communication interests you, then you would probably enjoy this exhibition very much. The opening night is Tuesday 4th June between 7pm and 9pm, and all are welcome. Email me if you think you would like to come along if possible, so we have an idea of numbers. I also have recent paintings on show, in which texture combines with colour in some process-led compositions, and though I haven’t decided yet which ones will be on show, there will be at least four of those I should think! In a rather disorganised manner, (or maybe just a differing narrative arrangement!) I loop back to the Rethinkyourmind strand. Let me expand the strand! I am so pleased. I like my work to be used in a socially engaged way! What we do is never just about us, I don’t think. We always leave a mark. The prize presentation for the 46 selected entries will take place in the Cholmondeley Room at the Palace of Westminster, House of Lords, London on May 1st 2013 with Professor Lord Patel of Bradford OBE. I am quite looking forward to that as I have wanted to visit the House of Lords for a while and this is a very good way of doing so! Each of the selected artists will get one of a hand bound copy of the book too. Rethinkyourmind was born out of the Leicester based Community Interest Company SISO (Safe Inside Safe Outside) with the desire to raise awareness of mental health, help people look at the subject from a positive perspective, and bring a sense of community into circumstances that can make people feel disconnected. I also submitted a poem, but I don’t think the link between the painting and poem was registered. (This was my fault I think as I didn’t make it clear, and there were two different selection committees!) However, the link is very important to me, and so here is the writing which accompanied the painting. Source of my life, spring upward! Refresh my soul, bring colour! They face my every move. Bring forward hope, hope for my living. I might play around with the punctuation I bit more and the line arrangement I think, but that will do for now. When painting the work I was very aware of how much it reflected my own need to draw from a source of refreshment and renewal, most particularly in those very dry, dark and difficult times, and so I do hope that seeing the image will continue to be a source of visual life and energy to those who do see it. Urban Dialogues Connect was an interesting evening, and I notice from the Urban Diaologues Facebook page that they have put up some photographic images from the evening which was held at the White Cube. Or is it The White Cube? I don’t like the lighting in there, though it maybe good for viewing artwork, it seems very harsh. The space is intimidating I think, though it must be pretty handy if you have HUGE sculptures to show. (I wonder how often they repaint it?) I don’t like having my photo taken at the moment, because I need to loose some weight, and doesn’t it just show in photos! The Urban Dialogues Connect gave me the opportunity to network a little, and I do have an interest in dialogue… Yes, I remember being constantly told off at school for talking too much! The idea behind the event was to enable artists from different faith/religious groups to network with view possibly of working collaboratively, which is something I could get very enthusiastic about indeed. It’s an excellent idea/vision, and I hope they do many similar things, as it does take time to work out who you could work well with. I am very glad indeed I found “A New Kind of Christianity” because it is one of the most interesting books I have read for ages. It seems to have stirred up all kinds of rather extreme responses from some quarters ( Brian McLaren is apparently a heretic and all kinds of other fearful things!) but it’s the book I searched for (without knowing if I would find it!) as I scanned the bookshop at Spring Harvest Minehead this year. I think his perspectives are timely and interesting, and challenging. Can that be a bad thing? I think not. The Saison Poetry Library houses the Arts Council poetry collection, the most comprehensive and accessible collection of modern poetry in Britain. The collection, dating from about 1914, consists of most poetry from the United Kingdom and Ireland, a large selection from English-speaking countries worldwide, poetry in translation, poetry by and for children, rap and concrete poetry. Audio and video facilities are available in addition to a large variety of magazines, press cuttings and ephemera. Membership is free and the library is open daily (except Mondays) from 11am to 8pm. I went along there for the first time this week, and I will be making this a regular trip in order to widen my own poetry reading, which kind of went to pot after I finished my Literature Degree. I do have the chance to visit Tate Britain, which I am going to do soon. I like the way things get shuffled around and the exhibitions change quite regularly. I haven’t been for a long while. It’s going to be a very nice walk there if the weather stays good. “Romanian-born twins Gert and Uwe Tobias (b. 1973), make collaborative woodcuts, sculptures, collages and drawings. Having moved to Germany in 1985, they studied in Braunschweig and live and work in Cologne. The influence of communist era style combines in their work with the legacies of European folklore and German post-war painting. The Tobias brothers’ giant woodcuts and wall paintings draw on modernist geometric abstraction; but they combine line, shape, colour and typography with the narrative images and patterns of folk art, using decorative motifs such as flowers, plants, patterns, embroidery and domestic objects. Their collages are like stage sets on which splashes of pigment and found images of animals or humans are assembled in a performance. Playfulness combines with violence as body parts are fragmented across the picture surface. Their figures also metamorphose into plants or birds; macabre yet innocent, they lend a surreal dimension to the Tobias’ imagery. The artists also use the antiquated aesthetic of the typewriter to create intense drawings that spike the eye. Wonderfully exciting work, beautifully described. Well worth a visit! I entered the Royal Academy Summer Exhibition this year, for the first time. I view it as a gamble, and a rather wild one at that. But nothing ventured, nothing gained. I would rather chance it. I’ve realised I don’t tend to highlight the fact that I have a website on this Jenny Meehan WordPress Journal Artist’s Blog, so I will try and remember to include at the foot of each posting my website details which are www.jamartlondon.com My jamartlondon.com website is quite new and so needs a bit of work bringing it up to date but it does give a taste of my practice, certainly in terms of showcasing some recent paintings from 2012, recent experiments with digital prints and also some examples of poetry. I have a lot more work than is shown on the website though, so if you want to commission something or have a particular kind of imagery or work in mind, do contact me. I enjoy working three dimensionally too, but I have chosen not to show that strand of work on the website, just to attempt to keep things tidy, at least in theory! I like history. I like engineering. (it’s in the blood). Here is the poster for the exhibition which Izzy put together using “Butterfly Core” as the background. It certainly does the job! 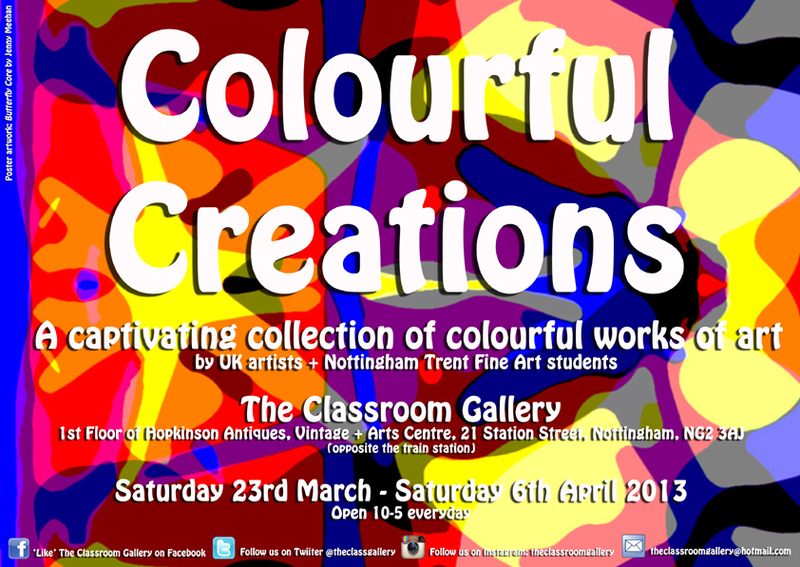 As you can see the exhibition runs from 23rd March until Saturday 6th April 2013. The work will be coming back soon. Thank you Parcelforce! I’ve popped in the work on show “Butterfly Core” and here is the text which I submitted along with the work. “This work started from an image of some paint splodges. I started with poster paint and folding the paper in half with paint on one side, made one of those butterfly prints many of us remember from childhood. Next, after a lot of experimentation and rather a lot of processing with image manipulation software, I ended up with something which made me think of new life and creative force. It was amusing to me that I started with butterfly wings and ended up with something reminiscent of the body of a butterfly. The work still has it’s splodge-like character, and the dyes in the printing process are so rich and deep. Jenny Meehan is an artist based in South West London who works with paint and digital photography. She exhibits regularly in her local area and also teaches painting and drawing in her kitchen studio. For more of her work see her website: www.jamartlondon.com. I don’t think the expression “splodge-like” is found much in art criticism presently, though I hope this will change ((!!! !000)) There are too many overused words, so I feel at liberty to include this descriptive. I think creativity is a matter of hard work. And confidence. Maybe putting yourself on the edge of what you can see. Maybe the word” insight” is better termed “chosen blindness”. Because there is a flinging of oneself, fear-filled, into the unknown. It is beyond “the box” of known outcomes. There must be faith. But it doesn’t need to be untested. Indeed, I think that preceeding the massive leaps one needs to take from time to time when creating and experimenting, let me say, playing, there are things we know we can depend on. Things we have done before. Things which suggested something a little further beyond themselves, though the substance of them we are not quite certain about. Things we have been tentative about, but risked doing anyway. So courage is important. There is no way around this. We can develop a lot of skill and this is very important. Practice and working very hard are essential. I don’t think one is just given something which then just dribbles out, at no cost to ourselves. There is a childlike openness which is needful. I think it might be to do with a surrendering of control, and a certain vulnerability. It’s seeing how much is beyond you, and not counting that as some kind of defeat, but rather of being placed in a place of awe, where you wonder, and that wondering is so great, that there is nothing else that can happen except that your mind is filled with endless possibilities. And the whole thing is not scary, but beautiful, because you can go any way you want, and it won’t matter if you make a mistake, because anything is possible. That is faith. It is childlike. This enables a lot of creativity to happen. The freedom is there for it to happen. There are lots of ways to see things, and trying them is the centre of playfulness. New Studios at Hawks Road, Kingston Upon Thames. Really enjoyed visiting the new ASC (Artist Studio Company) studios at Hawks Road, Kingston. Founded in 1995, ASC is a registered charity that exists to support visual and performing artists, educate the public in the arts and promote the arts. They also manage various studio spaces, and I think the Hawks Road studios are the newest, though I’m not sure. I took a look around several months ago, wishing for a space of my own, but cannot afford it at the present time, though I hope maybe in the future it might be something I can try out. It was nice to see some familiar faces of people I met previously at Wimbledon Studios, and also meet some other artists whose work I had not come across before. Came across this on Abstract Critical recently, and like it lots! It’s interesting to me the relationship between my faith and the importance of it in my life and also the importance of it in creativity. The two things cannot be seperated for me, because one begets the other. 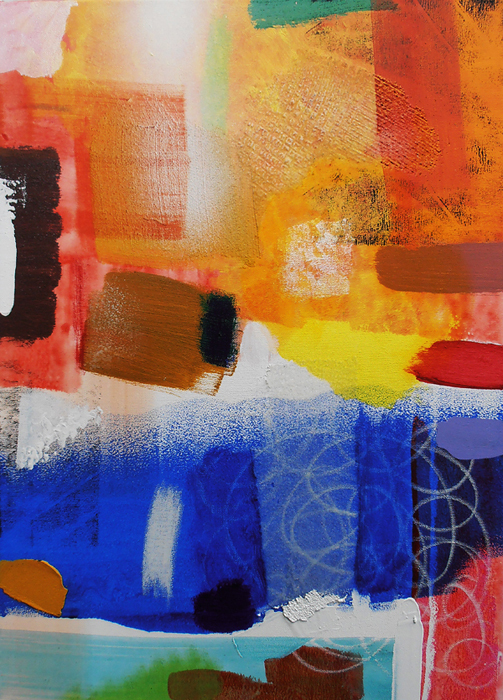 Maybe at this time when working with the paintings I am working in right now, (yes, I am working IN them, because they become my world in that present moment) I find the structures which emerge from the uncertainty helpful in some way. They ultimately emerge from my own experience and imagination, and there is a point when I use my will in a more determinate way, and define the direction, and my path ahead. They have to go somewhere. I don’t seem to want to make paintings which don’t arrive somewhere. There is always an arrival point. A point at which the relationship I have been having with the work has to stop. And sometimes that place is more definable to others and sometimes it is not. But this is the way I have been working. I wonder now if I might change this direction a little and start with some structures and work the other way? This is what I think I would like to do with the work I do next. I also miss and want the drama of the human figure. My recent life drawing course at West Dean has given me some figures to work with. The bottom line is that I want to paint everything I think of, which is most certainly impossible. I fear also that I have probably already written countless times before pretty much the same thing. My problem isn’t not knowing what to do, it is simply the matter of time restrictions. However, there might be some positive in this, because even time spent thinking can be working too. And just looking. It can all contribute to a single painting in very unexpected and unplannable ways. That is pretty much where I find my comfort when I cannot paint as much as I need or want to. The restraint of desire might be hard, but restraint is a blessing in the face of total freedom, which is how painting presents itself to me. Without end. 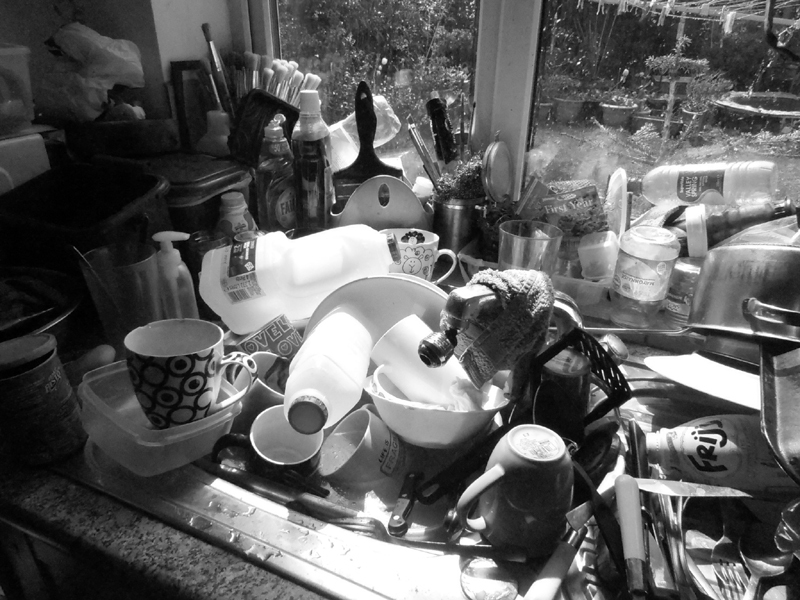 And washing up, without end. Well, it’s an arrangement. I need to add that there are advantages of having a kitchen studio. However, one is not the space. It is handy to have brushes mixed up with everything else though. There is never a moment in the day that I have any reason to have difficulty in finding a brush. I’ve been doing a little bit of poster/invite design myself in preparation for the Leatherhead Theatre painting exhibition. The exhibition of paintings by Derek Turner, Nigel Prabhavalkar and myself will be on show at Leatherhead Theatre, Church Street, Leatherhead, Surrey for a month. It runs from May 5th until May 31st. It’s a busy time for the theatre, which is good as there will be a good footfall. Here is the Leatherhead Theatre Invite Design. The Exhibition is called “Order and KAOS”. Quite pleased with the invite design. If you think you would like to come along to the “Meet the Painters ” evening event, which will be a very informal and relaxed do, contact me at j.meehan@tesco.net or via the contact form on my website which is http://www.jamartlondon.com and I will send you an invitation. The event is open to all but I would like an idea of numbers roughly if possible. I have three works selected for “Allotted” an exhibition at The Beetroot Gallery, but more on that later on. Later on in early June, at the Strand Gallery I have “London Downpour” being show as part of an exhibition focusing on the ‘practice and process’ of an idea. “The hope is to reconceptualise the artworks by exhibiting them in relation to works of varying practices, therefore creating a new narrative with one another – drawing a line between them.” This exhibition will include a variety of media; photography, sculpture, illustrations, graphic design, fine art, crafts and installations. There was a wonderful programme on TV recently about Polly Morgan and her amazing work. Seeing all those dead animals reminded me of when I worked in a reptile shop, many years ago. We used to take the frozen rats out of the freezer in order to thaw before feeding the snakes, and they came out in some very unusual poses…with all kinds of dramatic gestures depending on how they had been packed. We used to make little drama sketches with them, give them voices, and holding them by the tails like puppets play with them. Oops, rather diverted by that memory. That is probably more than enough for the time being!